Angels certainly feature in the Old Testament, as divine envoys and as mighty figures in the divine court – see for instance the overwhelming Cherubim in Ezekiel 1. But they are nothing like as central as they would become in what we sometimes call the inter-testamental period, and in the subsequent history of Judaism and Christianity. Nor are these older figures given anything like an individual identity. At some point in Jewish history, texts began referring to angels with specific names like Gabriel or Michael, and that trend reflects a basic shift in concepts of the supernatural hierarchy. That shift is significant itself in terms of the history of Western religion, but it particularly matters for anyone interested in early (or medieval) Christianity. My recent posts concerned angels, and specifically when and why they acquired names and individual identities. Angels are fully developed characters in 1 Enoch, probably from the third century BC, and that text was well known in the community that produced the Dead Sea Scrolls. That group had a special interest in angels and their doings, and their role in cosmic warfare. But the story is neither simple nor straightforward. One basic problem is that we really don’t know as much as we should about the Persian system and the great prophet Zoroaster (Zarathustra). Based on analogies with Western religions, we tend to assume that Zarathustra had some great insight, founded a religion, which eventually became the official creed of the mighty Persian Empire. Well, yes and no. The Department of Theology and Religion at Durham University has a long-standing tradition of outstanding research and is widely recognized as one of the leading departments in its field. In the 2008 Research Assessment Exercise it was ranked first in the UK, while its teaching quality is shown in its consistently obtaining exceptionally high rankings in both National Student Surveys and independent league tables. Its strengths range across Biblical Studies (Old Testament / Hebrew Bible, New Testament, ancient Judaism, and Biblical languages), Christian theology (Greek and Latin patristics, the history and theology of late antiquity and the early middle ages, the Reformation, doctrinal and philosophical theology, and theological ethics), and the study of religion (the anthropology, sociology and psychology of religion). It also has centres in Catholic Studies and Death and Life Studies; and research projects in spirituality, theology and health, and Anglican studies. The Department has a welcoming and collegial atmosphere, and is beautifully sited between the Cathedral and the Castle on the World Heritage Site in the centre of the city of Durham. The Department seeks to appoint a non-fixed-term Senior Lecturer in Old Testament / Hebrew Bible with effect from 1 September 2015. Those who currently teach in the area include Professors Walter Moberly and Stuart Weeks, while several other staff in the Department have cross-disciplinary research interests that relate to the Old Testament / Hebrew Bible. There is a fortnightly Old Testament Research Seminar, at which papers are presented by leading scholars from the UK and abroad as well as by members of staff and research postgraduates. More information about the Department is available at http://www.dur.ac.uk/theology.religion/ . The university is an equal opportunities employer and acknowledges a range of flexible working practices. a) To conduct outstanding research leading to publications of international significance in the field of Old Testament / Hebrew Bible studies, which may include ancient Judaism more broadly. e) To undertake administrative tasks in the Department of Theology and Religion, as agreed with the Head of Department. The post-holder will be responsible to the Head of the Department of Theology and Religion. The key responsibilities of the job will be in teaching (lecturing, seminar leading, course organisation, marking, and dissertation supervision), research (writing and publication) and administration, within the team of staff constituting the Department of Theology and Religion. ‘Research’ may extend to pursuing research which may create ‘impact’ as understood by the UK Research Excellence Framework, but this is not a requirement for the post. 11. The applicant’s research has the potential to shape the disciplinary agenda and/or create public benefit or impact in terms of individual or societal wellbeing or the economy outside the academic community. Guidance for written application 1. It is essential that in your written application you give evidence of examples of proven experience in relation to the selection criteria. (b) A short statement discussing your approach to beginners’ language teaching. Interviews will be held in January 2015 - date to be confirmed. PLO tries to censor the name "Temple Mount"
DOWN THE MEMORY HOLE: PLO Urges Journalists: Don't Use the Term 'Temple Mount.' Mahmoud Abbas's faction says journalists should only use 'Al Aqsa Mosque Compound' in blatant attempt to erase Jewish history. (Ari Soffer, Arutz Sheva). PA chief Mahmoud Abbas's Palestine Liberation Organization (PLO) has issued special instructions to members of the international media, urging them to stop using the term "Temple Mount," and to instead refer to the holy site as "the Al-Aqsa Mosque Compound" or "Haram al-Sharif/Noble Sanctuary." In a blatant attempt to impose a discourse erasing any reference to the Jewish character of the site, the PLO "media advisory" claims that the "Al-Aqsa Mosque Compound, sometimes referred to as the Noble Sanctuary (“Haram al-Sharif” in Arabic), is the compound that contains Al Aqsa building itself, ablution fountains, open spaces for prayer, monuments and the Dome of the Rock building. This entire area enclosed by the walls which spans 144 dunums [sic] (almost 36 acres), forms the Mosque." Be sure and follow the second link, which leads to the PLO document, which you can read for yourself. The term "Haram al-Sharif" is certainly one name for the site, but so is "the Temple Mount," and it is bizarre to claim otherwise or to demand that the latter term not be used. This odd demand, of course, contradicts the Waqf's literature on the Temple Mount from the early twentieth century, which, as the article notes, freely admitted the ancient Jewish connection to the site. Background here (where I report that a copy of the relevant Waqf pamphlet is in the St. Andrews University Main Library) and here. UPDATE: In a couple of places above I wrote "PA" when I meant "PLO." Now corrected. THE ARTS: ‘Jewish Mystic Jam’ seeks storytelling contest entries. It doesn't sound all that mystical, but they do have a drum circle. Tel Burna not a "cult complex" after all? HAARETZ: Cult fiction: Pagan relics found at ancient site fail to resolve Iron Age mystery. Pagan objects were common in ancient Judahite homes and not all animal bones originate in sacrifice, not to the gods at least (Julia Fridman). In any case, the focus on the cultic finds distracted from the main body of evidence, which indicates that Tel Burna was a Judahite stronghold located smack in the middle of two ancient Biblical city giants: the Philistine city of Gath and the Judahite city of Lachish. Tel Burna, a hillside site in south-central Israel, was occupied for several thousand years, from the Bronze Age to the end of the Iron Age. It was in the kingdom of Judah, King David’s old stomping ground. There is a great deal of evidence that if anything, Tel Burna was the site of a powerful Judahite stronghold, not a cultic hub as some papers - but not the excavator - have claimed. I expressed some skepticism about the "sanctuary" interpretation seized on by the media when the story broke. Now the excavators are doing the same, so I guess I am in good company. Yet another sign that the town belonged to Judah are archetypal Judahite handles of large four-handled jars found there, made of local clay. The jars are thought to have held either wine or olive oil. Some handles were decorated, including with a four-winged scarab beetle and another with a two-winged sun disk. Above these markings was the word lmlk ("[belonging] to the king," written in ancient Hebrew script), and below it one of four city names: Sochoh, Hebron, Zif and "Mmsht" (which has never been found). Similar handles have been found throughout all of ancient Judah. Some handles also had personal seals with names of individuals. One such found at Tel Burna bears the name l’Azar Haggai. The very same name had been found on seals in the nearby site Azekah, and at Gezer, though the design of the seal found at Burna is different. Archaeologists think the marking on the handles may have been affiliated with some sort of a Judahite administrative system. Read it all if you can catch it before it goes behind the subscription wall. THIS WEEK'S DAF YOMI COLUMN BY ADAM KIRSCH IN TABLET: Converting for Love (Like Natalie Portman’s Husband)? The Talmud Forbids It. Talmudic Rabbis regulated not just actions but reputations, and left a legacy we debate and refute to this day. I always think of Natalie Portman's husband as Darth Vader, but I suppose that's neither here nor there. TOMMY WASSERMAN: Report from the Digital Collation Conference in Münster (ETC). I'm glad to hear that Collate is still around. APOCRYPHICITY: Conference Program for “Ancient Jewish and Christian Apocalypses.” Coming in mid-November in Berlin. THE ANXIOUS BENCH: Of Scriptures and Superheroes (Philip Jenkins). Some modern-day examples illustrate the kind of cultural curiosity that drives such a process of intertextuality and cross-referencing, although they are not ones that usually feature in Biblical or extra-Biblical scholarship. Bear with me in this thought-experiment. Popular culture regularly produces figures or works that seize the imagination, heroes like James Bond or Batman, mythological worlds like Star Trek or Star Wars. Initially the works stand alone, but their respective worlds soon expand to include spin-offs and sequels, prequels and origin stories. Perhaps these offshoots develop the principal character and supply more information on his or her deeds, or else minor figures expand to become central to new works and series. Individual characters migrate into other genres and mythologies. LARRY HURTADO: “The Formation of the Jewish Canon”: Lim’s New Book. Earlier reviews etc. here, here, and links. BIBLE PLACES BLOG: Trial Begins in Jacobovici’s Lawsuit Against Zias. JAMES MCGRATH: Mythicism and the Teacher of Righteousness. I generally don't have the patience to engage with mythicism (i.e., the idea that Jesus never existed), but I'm glad James is willing to take it on. Scrolls exhibit shines light on ancient links. Hong Kong was picked as the venue of the Dead Sea artefacts exhibition, which opens today, because of its cultural diversity (Elizabeth Cheung, South China Morning Post). The main exhibits are the Gabriel Revelation Stone and a replica of the Great Isaiah Scroll. Background here. And more on China's current interest in Judaism is here and links. Reading Philo: Why and How? The book is: Torrey Seland (ed. ), Reading Philo: A Handbook to Philo of Alexandria (Eerdmans). ASKING THE IMPORTANT QUESTIONS: Did Jesus Die in Outer Space? (James McGrath in Bible and Interpretation). The attempt to use later sources, interpreted in ways that are at best open to dispute, in an attempt to argue against what generations of skeptical scholars have concluded to be likely with respect to the early Christian sources, is never going to make mythicism seem more probable than the hard-earned and intensely-researched consensus of historians and scholars, namely that there was a historical Jesus of Nazareth. Also, Old Testament pseudepigrapha are involved. WHAT'S NEW IN PAPYROLOGY: Choat, M, and Gardiner, I. edd., A Coptic Handbook of Ritual Power. From the new series The Macquarie Papyri. 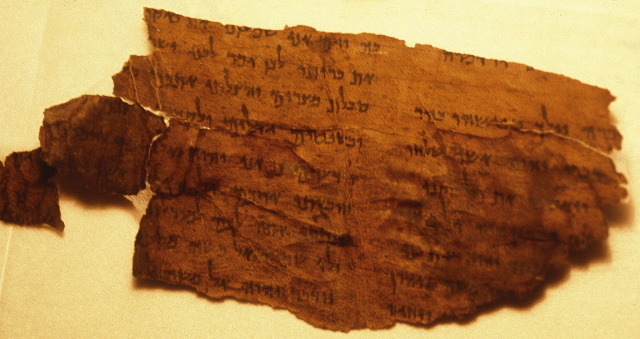 THE TALMUD BLOG: A Tantalizing Tale of Temura Fragments – Guest Post by Noah Bickart. KHAN ACADEMY: Relief from the Arch of Titus, showing The Spoils of Jerusalem being brought into Rome. Narrated by Dr. Steven Fine and Dr. Beth Harris. HT reader Yehoshua Rabinowitz. Lots more on the Arch of Titus here (scroll down) and links. I have been following reports about the (traditional) Tomb of Ezekiel for years (most recently here). Reports from several years ago about its fate were pretty positive, but if this latest report is accurate, recent developments have taken a serious turn for the worse. More on the destruction of the Jobar Synagogue and on those Hebrew manuscripts from Damascus is here and links. I had heard of the destruction of the (traditional) tomb of Jonah in Mosul, but this is the first I recall hearing about the destruction of the (traditional) Tomb of Daniel there, although I see now that it too has been included in the news reports. Egypt was a melting pot of languages as well as of religious traditions. Aramaic arrived in the sixth century BCE as the lingua franca of Egypt’s Persian conquerors, joining the Greek, Carian, and Hebrew tongues already spoken there by pharaoh’s foreign mercenaries. A superb set of Aramaic papyri displayed in this show provides a kind of biographic sketch of one Ananiah, a Jewish garrison soldier stationed at Elephantine (modern Aswan) who married an Egyptian slave named Tamet, acquired property, refurbished his home, and passed on his estate to his children, Pilti and Jehoishema. Though they precede the Ptolemies by a century, and have no connection either to the Greeks or their rule, these perfectly preserved documents illustrate one family’s journey through time in the polyglot, multiethnic valley of the Nile. Ananiah lived in an Egypt that chafed under Achaemenid Persian conquerors who ruled from afar and disdained local traditions. Small wonder then that the Ptolemies, who made themselves at home in Egypt and embraced much of its culture, proved such a long-lived and successful dynasty, overthrown in the end not by revolt or rebellion but by the armies of the rising power of Rome. Background on the exhibition is here. More on the Elephantine papyri is here and links. ARASH ZEINI: Zoroastrianism in Iranian history. A 2012 article by Michael Stausberg available online. Few documents in world history can match the inspirational impact of the New Testament. For all its variety – gospels, letters and visions – this first-century collection of texts keeps always at its centre the enigmatic figure of Joshua/Jesus: the Jewish prophet who gathered a group around him, proclaimed the imminent end of the world, but was made captive by the authorities of Rome only to suffer a shameful criminal’s death on a cross. When his followers (including former persecutor Saul/Paul) became convinced that Jesus had defeated extinction, and had risen again to fresh life, the movement crossed over from Palestine to ignite the entire Graeco-Roman Mediterranean world. The author shows how the writings of this vibrant new faith came into being from oral transmission and then became the pillar of a great world religion. He explores their many varied usages in music, liturgy, art, language and literature. In discussing its textual origins, as well as its later reception, Moxnes shows above all how the New Testament has been employed both as a tool for liberation and as a means of power and control.